Do you love crocheting with self-striping yarn? Then you will enjoy every stitch of crocheting this slouchy beanie. When you finish, you’ll have a beanie that is super soft and warm. And it has a pom pom. Who doesn’t love that? Do you love cool colors? Then you will enjoy every stitch of crocheting this slouchy beanie. When you finish, you’ll have a beanie that is super soft and warm. And it has a pom pom. Who doesn’t love that? After years of trial and error, I’ve finally figured out how to crochet near perfect stripes. Now, I hope you can too! This beanie is not crocheted in the round, but instead it is crocheted in joined rounds. That way, the stripes are much smoother and the seam is practically invisible. Change up the colors and make it your own by substituting any bulky weight yarn that you prefer. I hope you love this pattern as much as I do! Crush your next crochet project! The colors of this beanie remind me of a strawberry patch. 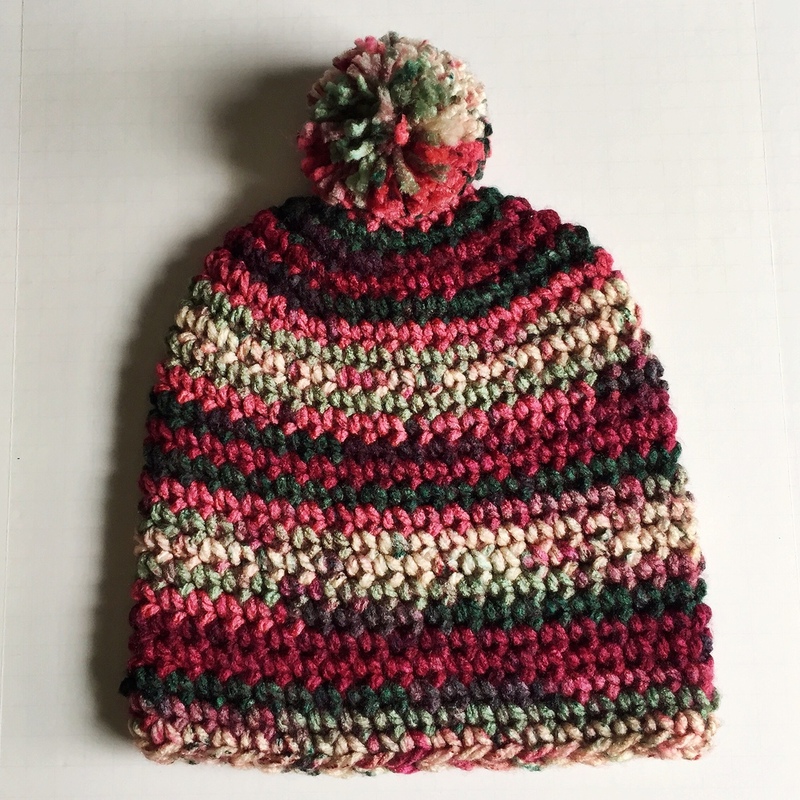 To crochet this beanie, you will use bulky weight yarn and worsted weight yarns together to create a thick, warm beanie. The pattern includes sizing options for teens, women and men and is written using standard American crochet terms. 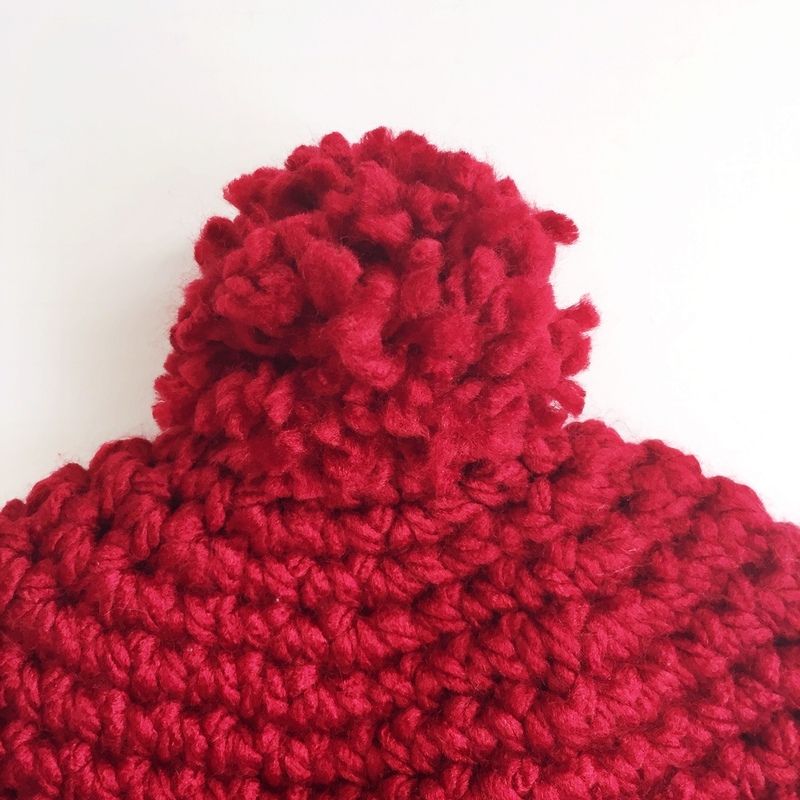 This pattern creates a beanie that is chunky, soft and warm. The yarn makes this beanie unique with light and dark gray fibers woven together. Since the yarn is super bulky weight, you’ll be able to bust out this beanie in a couple of hours or less. The pattern includes sizing options for teens, women and men and is written using standard American crochet terms. I have three brothers, and guys can be so hard to buy gifts for! But this striped beanie makes a perfect gift for a guy, especially if he's a sports fan. Just switch out the navy and blue colors for any shades of bulky weight yarn that represent his favorite team. With a handmade gift like this, his head and his heart will be warmed! This Charcoal yarn is so great! I love the way it's mostly black, but has little wisps of light gray winding through it. I start to get bored with solid-colored yarn after awhile, and this is much more interesting to work with. Although, it has some tiny imperfections. If you look at the very right hand edge of the beanie toward the middle of the hat, you will see a little gray spot where the yarn had too much gray compared to the rest. I tend to be a perfectionist with my crochet, so it bugs me just a little! ;) But I still like the yarn. You may know that I am a big fan of the Denver Broncos football team. I purposely made this beanie in Broncos colors, but I didn't want to name it the "Broncos Beanie" because copyright and licensing and whatnot. So, just had to get it out of my system. It's a Broncos beanie for Broncos fans, or the colors can be customized for fans of any other sports team! The Super Chunky Granite Beanie is thick, soft and warm. The yarn makes this beanie unique with little flecks and brown and black. Since the yarn is super bulky weight, it works up fast. You’ll be able to bust out this beanie in a couple of hours or less. The pattern includes sizing options for teens, women and men and is written using standard American crochet terms. This weekend I went snowboarding in Steamboat Springs, Colorado. It was closing weekend so there were big parties with live music and fun. While I was at a free blue grass concert, I noticed a lot of people wearing beanies with pom poms. And they looked so cute, that I had to create my own! The pattern is sized for to fit adult women and is written in standard American crochet terms. I'll be honest. I use a lot of Q-Tips. Almost every day, I accidentally smear my makeup around on my face and I need to fix it with a Q-Tip. The annoying thing is that my bathroom vanity is tiny. So, every day, I have to reach in the little cabinet underneath and feel around for the gigantic box of Q-Tips because it won't fit on the counter or anywhere more convenient. I played around and designed a teensy little crocheted Q-Tip holder! This little baby whips up in about 20 minutes and holds my Q-Tips conveniently within reach. I used a small hook, F/5-3.75mm, so that the stitches would be really tight to give it some structure so it would stand up straight and not flop around. I did not crochet this in continuous spirals. I tried that, but the top of it always looked a little wonky and not flat. So, instead, I used joined rounds, which you will see in the pattern below. See! Even my cat, Penny wants a piece of this action! Haha! She's soooo helpful when I'm doing my crochet photo shoots. She's sure everything is a toy just for her. What a princess. I love me a pom pom! Especially when it's attached to a soft, warm slouchy beanie. This beanie is made using bulky weight yarn, so it's extra warm and the stitches look very chunky. It also works up super fast! You should be able to bust it out in two hours or less. Let this beanie warm you up like a tropical breeze! I wasn't sure what to call this beanie after I made it. The yarn is called Sunny Day, but that just didn't quite feel right. So, I put a picture of it on Facebook and asked for suggestions. I got a lot of great ones, but my favorite was from my mom! She's such a creative lady. 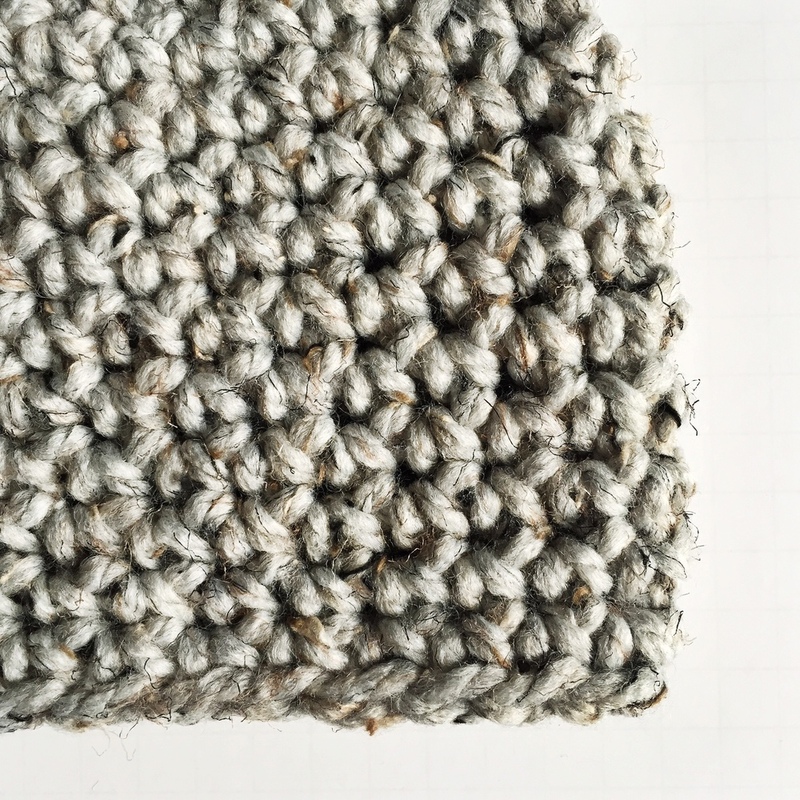 This pattern makes a chunky beanie with a near perfect stripe!